With every activation of the random vector button a vector arrow with random orientation is generated. Starting at the origin, its endpoint has random integer coordinates x,y,z. They are displayed in three editable number fields. There the coordinates may be changed to any rational number. An alternative one can draw the arrowhead in 2 dimensions with the mouse. x = integer(10*random( ) - 5). 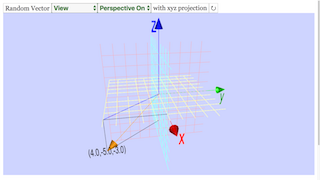 A button with/no xyz projections shows or hides projections of the arrow onto the coordinate planes. Five different radio buttons view select among a number of different distinct projections. Of them the 2D projections are especially suited to directly read the coordinates in the drawing frame. The 3D frame can be rotated by drawing with the mouse, zoomed by drawing while the Shift key is pressed, and shifted by drawing while the Strg key is pressed. I am a physic teatcher, trying to inoculate the pleasure to learn physic in a high school of Geneva, Switzerland. Clicking on random vector will randomly generate a vector within the plots. Clicking on the view will allow you to toggle the 3D panel respective perspectives. Components allow you to manually key in the coordinates of your own vector. 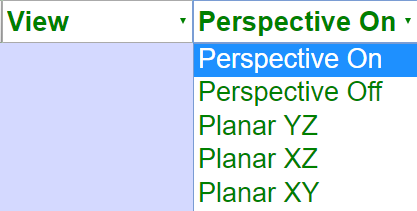 Pressing the xyz projection button will toggle it's visibility.